There are still some photos and stories to share from my travels around New Zealand’s North Island, back in 2016. In the last article I showed you the coastlines near the Bay of Islands and Whangarei. We spent a wonderful week up there and quite interestingly didn’t encounter too many other tourists. Northland hasn’t become one of New Zealand’s hot spots yet, but as we drove down south, this changed. The campsites became more and more crowded and at least during daytime we no longer found the solitude we had enjoyed during some of our hikes up in Whangarei. Keeping an eye on the weather forcast is very important in New Zealand. Especially if you are planning a visit to Tongariro National Park as we did. I found Metservice to give a quite accurate forecast for the next three to four days. So we tried to stay flexible enough to adjust our travel route in order to avoid spells of bad weather. For this reason, instead of driving directly towards Tongariro National Park, we first went down to Waikato to visit the Bridal Veil waterfall. While there was still a high chance of rain for Tongariro, closer to the coast the weather already looked much better. After finding a caravan park for the night, we didn’t waste much time and drove up to the famous Bridal Veil waterfall. The parking lot was packed and the several viewpoints around the waterfall as well. But this didn’t bother me too much, since it was still more than two hours until sunset. And, if I could trust the weather forecast and Photographer’s Ephemeris, there was a good chance to get a very special photo this evening. When researching the area I always saw the same photo of the waterfall. You basically only have one possible composition to photograph from the top platform. Hence there’s not too much room for creativity. But when I looked at the lay of the land I was wondering why I didn’t find photos of the waterfall taken during sunset. At first I wasn’t sure, if the photo I had previsualized was even possible. As sunset approached and more and more people left I was suddenly the only person at the falls. And just then the light show began. Exactly as I had hoped it would, the sun was in the perfect position to light up the waterfall and bath the whole scene in golden light. With the dark clouds above I was able to take a unique photo of a waterfall that has been photographed many times before. 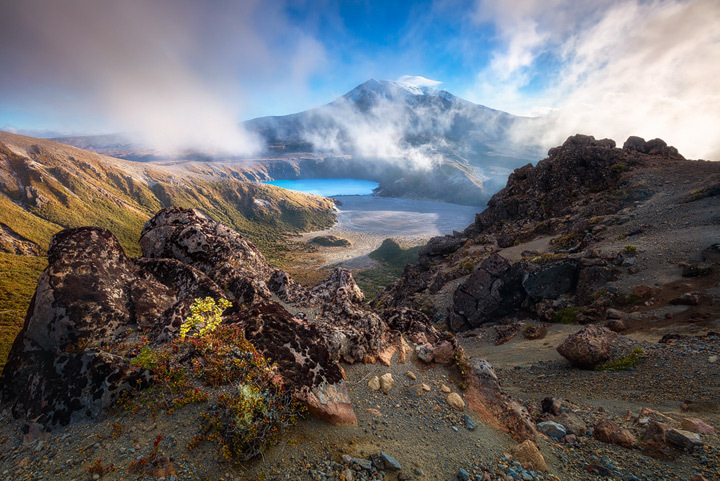 The following day it was finally time for our second visit to Tongariro National Park. Back in 2014 we weren’t very lucky with the weather and didn’t even see the volcanos. This time the forecast looked promising. But as we arrived there were still thick clouds obscuring the mountains. This was a bit of a bummer, because I had wanted to explore the Tama Lakes area that evening and photograph sunset. But since the alternative would have been to stay at the caravan park I decided to do the hike anyway and see, if the weather would change. It’s a beautiful 9km hike up there and after 90 minutes I stood at the viewpoint, which I thought would provide some nice views for sunset. Yet for the next hour there was not much of a view at all. But it was very peaceful and I found a nice spot, which was shaded from the wind. There I sat and enjoyed the tranquility. As so often during my travels around the world I was the only person out there. And then suddenly I saw the first patches of blue sky overhead. The wind was picking up and minutes later I got my first glimpse of Mount Ruapehu. I quickly adjusted my composition, but thankfully I didn’t have to move around a lot because my previsualization had been quite accurate. I was in the perfect spot! I stayed for one hour, taking several compositions and then as the sun slowly set behind the horizon started my hike back towards Whakapapa village. 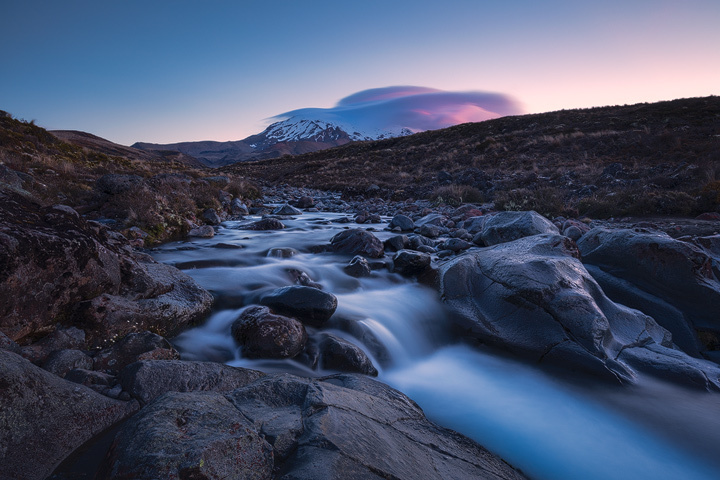 I didn’t expect to take another photo, but as I arrived at the bridge above Taranaki Falls I noticed those beautiful clouds piling on top of Mount Ruapehu and how they caught the last light of the day. After taking this final photo I quickly jogged back to our campsite for dinner. The next day we did the Tongariro Crossing with thousands of other people. With a clear blue sky overhead we had great conditions to do the hike. But for the same reason there were even more people on the track. While I enjoyed the views, the hike itself was not very fulfilling. Don’t get me wrong here. The scenery is awesome and without that many people it would have been easily one of the best hikes I ever did. But in parts where the trails get a bit more narrow we were basically stuck within a huge mass of people moving slowly along the Crossing. I’m normally quite a fast hiker and I love the flow and rythm of a good walk through the mountains. This just wasn’t possible during the Crossing. But I had already expected this and the main reason for me to do the Crossing was to scout the area. I was looking for viewpoints, to which I would return for sunrise on one of the next days. 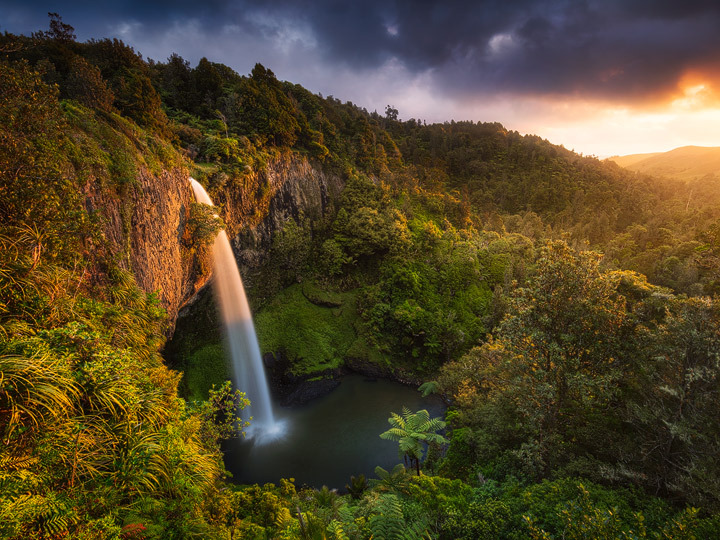 The evening after doing the Crossing I went back once more to Taranaki Falls, hoping to catch some nice light again. But the weather moved in and stayed for the next day. 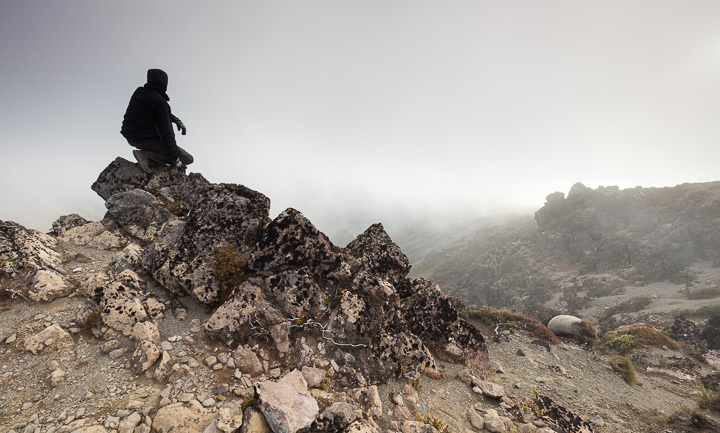 On a rainy day there’s not too much you can do in Tongariro National Park… Besides visiting another waterfall. 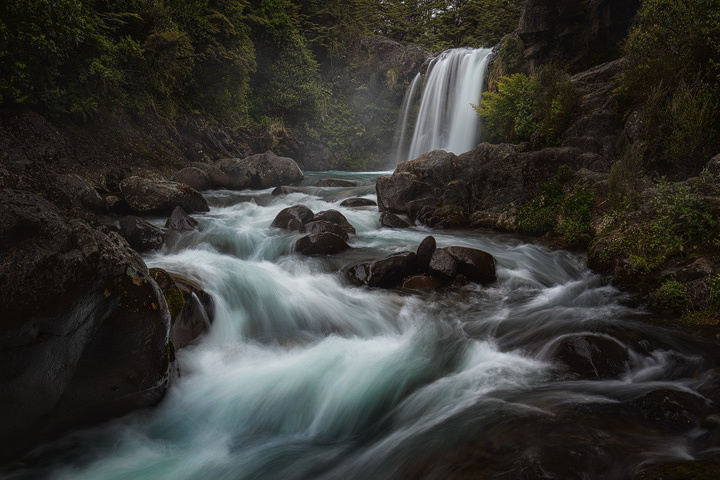 And that’s what we did – Tawhei Falls was just a five minutes drive away from Whakapapa village. It’s one of the locations used in Lord of the Rings – the so called Gollum’s pool, where Gollum kills some fish before being caught by Faramir’s men. The rain was actually perfect at this location. I’ve read that there are usually many people visiting and this can make photography a bit hard. But on this rainy day the area was empty. The rain also added a lot to the atmosphere, which I tried to enhance a bit during post processing as you can see in the tutorial video I posted on Youtube a few months ago. With the rain of the day it was also easy to get some rest. Because there was still one thing I wanted to do. I wanted to actually enjoy the Tongariro Crossing. And for this I had to start my hike at 2:30am the following day, long before the crowds would arrive. At 2am we left the campsite and drove over to the trailhead. My girlfriend stayed in the van to catch a few more hours of sleep while I hiked 10km through the dark, volcanic landscape. It was an awesome experience. It was totally silent, there was no wind at all and also not a cloud in the sky. It took me less than two hours to get to the viewpoint I had scouted two days before. The smell of sulfur was quite strong that morning. 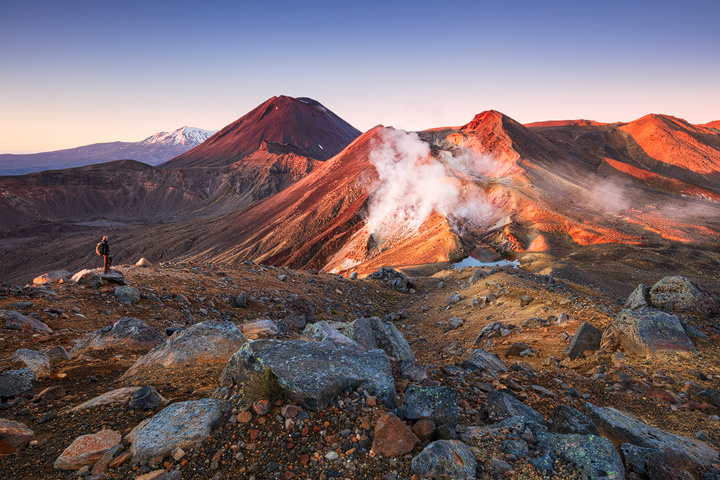 One has to know that the volcanos of Tongariro National park are still active. Although there hadn’t been an eruption for many years I made sure to check the alert levels before starting my hike. This way the smell didn’t bother me too much and I was quite at ease, while waiting for the first light to hit the top of Mount Ngauruhoe. After putting in so much work for this photo I was a little bit dissapointed that I didn’t get any clouds that morning. But that’s just how it is and the dissapointment I felt was quickly replaced by deep joy as the sun lit up the volcanos. Having such a view in front of yourself and knowing that you are likely the only person within a radius of 10km is something very special. And I’m very grateful to have had the opportunity to experience this. And who knows, maybe I’ll come back in a few years. Then I don’t even need to scout anymore and can directly hit the trail in the shadow of the night.